The Innovating technology and energy conservation concerns have led to development of tankless water heaters that works on the principle of heat transfer, using gas or electricity eliminating the excess energy consumed by the traditional water heaters. The technological advancements to reduce energy consumption (reduced by 22%) in commercial and residential places are increasing the demand for electric tankless water heaters, thus propelling the growth of the market all over the globe. Moreover, the growing construction of new spaces such as luxury hotels and smart homes are impelling the growth of global electric tankless water heaters market. Installation of electric tankless water heaters is seen to be increasing in commercial spaces such as hotels and office spaces and only the residential spaces equipped with advanced technologies mainly in urban areas are witnessed to have installed tankless water heaters. The rising e-commerce sector has further facilitated the supply of electric tankless water heaters such as in U.S.A. Installation of electric tankless water heaters are more preferred than the gas ones on account of latter requires separate gas pipeline and more maintenance, but on the other hand gas tankless water heaters has higher flow rate than electric ones. Further, the challenge faced by the global electric tankless water heaters market is the higher cost than the traditional heaters, which fails to cater the masses. Goldstein Research analyst forecast that the Global electric tankless water heaters market is set to reach USD 11,230 million by 2024, growing at a CAGR of 5.24% over the forecast period (2017-2025). Non-condensing technology based electric tankless water heaters have higher demand as is their functioning it pushes out hot gases out of the vent to avoid corrosion. Non-condensing electric tankless water heater uses stainless steel category 3 venting which reduces the maintenance but also increases the product cost and can be a barrier for growth of the market in some segments of the society. Based on geography, Europe accounted for largest market share followed by Asia-Pacific and North America. European countries are highly concerned towards sustainability and energy conservation, thus adapting different technologies towards reducing wastage and minimizing pollution thus acquired 37.1% market share in 2017. In APAC region China and India tends to be the fastest growing markets at a CAGR of 5.3% and 5.42% respectively on the back of urbanization and huge construction activities. 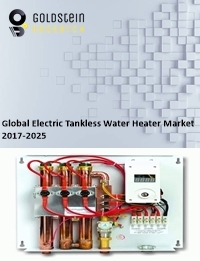 The report covers the present ground scenario and the future growth prospects of the electric tankless water heaters market for 2017-2025 along with the market players’ analysis. We calculated the market size and revenue share on the basis of revenue generated from major players in the Global. Global electric tankless water heaters market is forecasted on the basis of electric tankless water heaters units produced and shipped. Global Electric Tankless Water Heaters Market Outlook 2017-2025, has been prepared based on an in-depth market analysis from industry experts. The report covers the competitive landscape and current position of major players in the Global electric tankless water heaters market space. The report also includes porter’s five force model, SWOT analysis, company profiling, business strategies of market players and their business models. “Global Electric Tankless Water Heaters Market Report” also recognizes value chain analysis to understand the cost differentiation, pricing models to provide competitive advantage to the existing and new entry players. Our Global electric tankless water heaters market report comprises of the following companies as the key players: Bosch GmbH, A.O. Smith Corporation, Bradford White Corporation, Rinnai Corporation, Hotter Electric, Atmor & Eemax, Nortiz Corporation, Inc., Stiebel Eltron, Rheem Manufacturing Company, Alpha Electric Co., etc.